The Sony Xperia XZ Premium brought 4K HDR to a Sony flagship along with some competitive internals, while the Xz1 brought some powerful specs in a more midrange, traditional form factor. Now, Sony has unveiled the XZ2, which sees not only an upgrade in performance, but a complete design overhaul as well. While Sony has certainly lagged behind in the US market, the XZ2 and XZ2 Compact are pure 2018. From the large 4K display and smaller bezels to the new Snapdragon 845 chip, Sony is stepping it up this year. It's not clear whether the XZ2 is what it'll take for Sony to break through the juggernaut of US smartphones, but from our view, it's a worthy effort. The XZ2 devices were only revealed on Sunday, but they should be here within the month. While no definitive dates have surfaced, Sony claims the XZ2 and XZ2 Compact will be available this coming March. The XZ2 might not be a "bezel-less" phone like we've come to expect nowadays, but it certainly has trimmed away most of the fat. The XZ2 looks great with its 4K HDR 5.7" display, even with a more pronounced top and bottom chin than, say, the Galaxy S9 (but certainly not the iPhone 8). The XZ2 Compact, on the other hand, has a smaller 5" display. However, it's still that crispy 4K HDR resolution you'd find on the XZ2, so you won't be sacrificing quality if you choose the smaller device. The XZ2 and XZ2 Compact come in four unique colors each. Due to the XZ2's metallic makeup, its colors are deeper than the Compact's. However, each has a black, silver, green, and pink option. The XZ2 comes in Liquid Black, Liquid Silver, Deep Green, and Ash Pink, while the Compact comes in Black, White, Moss Green, and Coral Pink. The XZ2 is a force to be reckoned with when it comes to pure power. Sony installed the latest Snapdragon 845 SoC in both the XZ2 and the XZ2 Compact, along with 4 GB of RAM and 64 GB of internal storage. You also have up to 400 GB of expandable storage to work with, if that 64 GB doesn't cut it. Sure, we'd like to see a higher internal storage option. But 4 GB of RAM is good news, even if other Android devices have managed to fit up to twice that amount of memory. While slightly slower than the S9's Snapdragon 845, the XZ2 screams with speeds of 2.7 GHz. For comparison, the OnePlus 5T's Snapdragon 835 was clocked at 2.45 GHz. There's no doubt here — Sony's latest device is fast. The XZ2 has a great camera on paper, and it should — Sony is a well-known lens maker, so you'd expect its smartphones to come equipped with some decent camera tech. The XZ2 comes standard with a 19 MP rear camera, which is capable of shooting 4K HDR video, HDR photos, and, notably, 960 FPS slo-mo at 1080p. Samsung boasted about its 960 FPS feature in the new S9, but they cap their resolution at 720p. We won't know for sure until we get our hands on the camera, but it looks like the XZ2 might be one to consider for any photographer out there. The front camera, however, isn't anything to write home about. It's only 5 MP, which isn't bad. Megapixels aren't everything, of course, but the S9 and iPhone X both have Sony beat in this field. Selfies are important in 2018 — will 5 MP cut it? If you like your phones on the small side, don't worry about losing any features by picking up an XZ2 Compact — both phones have exactly the same cameras, so you won't be missing a thing with Sony's smaller offering. A smartphone really is only as good as its battery. The XZ2's, from our view, can go either way. The 3,180 mAh battery found in the larger device certainly isn't huge, like the 4,000 mAh of the Razer Phone. However, Sony is pushing "Smart Stamina," which will warn you if it feels you're using too much power to turn on, essentially, a low-power mode. Sony thinks Smart Stamina will keep your phone running all day, but we'll see. Let's hope the same rings true for the XZ2 Compact, whose battery is only 2,870 mAh. While the Compact has 0.7" less display to power than the XZ2, it still has to contend with the same powerful Snapdragon 845 chip. Be warned — you might not be buying the XZ2 Compact for its battery life. One spot of good news is that both XZ2 devices ship with Quick Charge 3.0. Even if the XZ2's battery life stinks, you'll be able to charge it back up in a jiffy. Unfortunately, only the XZ2 features wireless charging, as the Compact is made of plastic. If wireless charging is a must for you, go for the regular XZ2. Plus, it comes with a free charging stand! Sony has implemented a new type of feedback into the XZ2 called "Dynamic Vibration." The vibration in the XZ2 works with the content you are viewing or interacting with to give you more realistic and appropriate vibration based on what's happening on-screen. You can choose from different intensities at any point, as well as turn off the feature entirely. The XZ2 Compact does not have this feature, so those looking for upgrades to a traditional smartphone vibration will want to stick to the larger XZ2. The XZ2 comes with two stereo speakers, which we more than welcome. Your games, videos, music and more will be both louder and more immersive thanks to the speakers on the front and bottom of the chassis. Like we said, the Sony XZ2 is a 2018 smartphone — sadly, that means no headphone jack. While it's a decision that more and more OEMs are making, it still hurts to see new phones without that port. Some of us still have wired headphones, Sony. 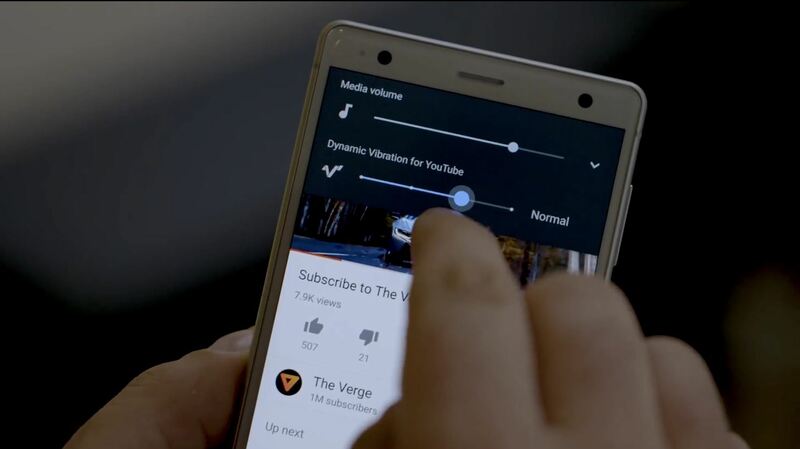 News: Sony Brings Android N to Xperia Z3 Phones—Will Other Manufacturers Follow?